His name is Takeshi Hongo, his visage can be found throughout the city of rolling stones. Forever changed by his encounter with a terrorist organisation, he vowed to devote his life to giving people hope and the defense of life. His proud poses and physique ready to protect the weak and innocent, his red scarf waving in the salted wind like a tenacious banner, vast ant­eyes defiant of any evil or wrong. He is the Kamen Rider, and he may be a fictional character from the world of television and manga, but he is very much real. Hongo’s presence is felt throughout Ishinomaki­shi which translates roughly as ‘the rolling stone’. Amid the devastation caused by the earthquake and tsunami of 2011, Hongo still stands, defiant of tragedy, his statues adorn the city with hope and pride, comforting the town’s children and surviving as a symbol of human tenacity. He and his superhero compatriots survived the tsunami ­ Robocon the mighty and gentle robot, Sea Jetter who defies the monsters of the sea themselves and Cyborg 009 a team who through working together can overcome anything. 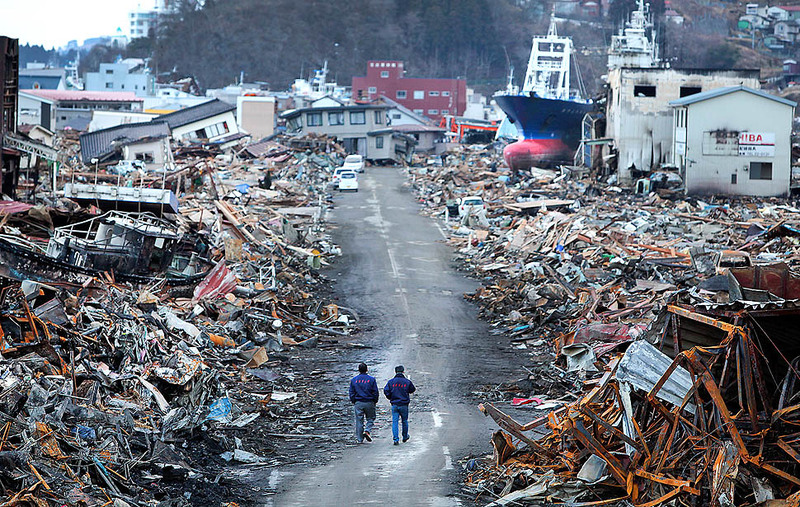 After the tsunami swept the nearby town of Funakoshi which is under the jurisdiction of Ishinomaki­shi, many of the survivors left to try and start a life elsewhere. Among them were the town’s officials who saw the town as unsalvageable. This left those who remained without the manpower to continue an economy, without the institutions to establish a new community and without the leadership to fuel the effort. Or so it would seem. Nakasato­san likes to tease visitors by dancing to his favourite song from Hokkaido and making them join in. It might not even be his favourite, but it breaks the ice. He smiles rarely but radiates joy with every word. He is a fisherman, but in the absence of Funakoshi’s traditional leadership, he took it upon himself to organise the effort to rebuild the town and return his community to normalcy. With him as the epicentre, the community’s heart began to beat again. They reorganised their fishing efforts and with the help of international volunteers were able to reignite local industry. Plans began to be made to move the town further uphill, where it would be safe from future disasters and most importantly, the community continued to meet, continued to celebrate the home they shared in one another, congregating regularly at a local school. People bring food and prepare crafts imprinted with their heritage and the visages of their home’s natural beauty; from the blossom of spring sakura to the blaze of scarlet forests in autumn. People of all ages gather in the town school to talk, sing and plan. They bring their new harvest of seaweed to celebrate their achievements, fried manju buns filled with red bean paste and inari sushi, bounty meant for the fox spirits who do mischief and bring fortune. And though fox spirits may abound and people introduce me to tree gods with vast, ancient trunks ­ it is clear, people are answering their own prayers. Not far is the town of Onagawa, also a part of Ishinomaki­shi. Here businessmen and fishermen cooperate to establish a centre from which fish can be centrally organised and sold. Across the Ishinomaki area, people work through the night to harvest their clam farms, the air is bitter and cold, but the pots of soup boil on and fuel us through the oceanic dark. Lights scatter the shore and drift out to sea like sparks from the dark workshop of a mighty, unearthly blacksmith. Masae is a native of Ishinomaki, working with international volunteers and her partner, Londoner Jamie, she and her team have done much to try bring this long night to an end. Masae established a local non­profit ­ INJM (It’s Not Just Mud) which takes requests for assistance and capacity building from around the community and offers human resources ­ such as creativity, labour for the economic effort of re­establishing the vital fishing industry, warmth and earnest good will in community celebrations and gatherings like the Autumn Children’s Fair where her team set­up stalls and spend time with children, trick or treating at the local temporary housing camp where gifts and sweets are handed to the residents and planting flowers to break the desolation and making strides to return normalcy to people’s lives by re­establishing everyday amenities and services. The Ishinomaki area is the site of the largest temporary housing camp in the world, now home to hundreds upon thousands of people who lost their homes in the earthquake and tsunami of 2011. The temporary housing units are called Kasetsu. They provide very basic, subsistence living to those who need it, which is many. They freeze in the winter and are often devoid of vital human outlets such as playgrounds and parks. Masae’s team, working with Playground of Hope, constructed a large interactive adventure park for the Ishinomaki Kasetsu’s children. The project is massive and we have to work hard to a short deadline, but we do it and for the first time since the disaster, countless children have a place to play and have their childhoods returned to them. The community celebrates and in doing so, defies the calamity. Masae’s team go on to work with Habitat for Humanity, to rebuild bus shelters, tables, chair and benches, simple things that people need to feel like they can live normal lives again, places for people to rest and be out of the rain and the bitter ocean wind. Slowly community hubs re­open and pump light into the streets and lives of people. A local sake shop, an antiques store, the local onsen public baths­ but what is spear­heading this revival? The Kasetsu, the temporary housing units. When people think of refugee camps and housing for displaced people, they often think of deprivation and hopelessness. A loss of being and place and future. The people of Ishinomaki however, did not allow for that to become their mindset. The Kasetsu became centres of possibility and imagination, entrepreneurship and aspiration. The notion of temporary housing became an opportunity to build something new, to have a fresh start and bring something unique into the world. Entire temporary housing units were turned into food halls, filled with takoyaki ­ steaming octopus balls, curries and noodle soups bursting succulently with the iridescent flavours of the Miyagi ocean’s local catches of mussels and squid, clams and fish and crab. Bakeries were opened specialising in fluffy and thick loaves, serving pastries filled with the unique taste of nut butter and red bean paste. Despair became opportunity. Teenagers returned to the basketball courts and took to the fairs in dance squads. People were living again. Not far away, in the city of Sendai, people waste no time in reclaiming their festivals. They set bonfires and put up lights in celebration of everything they still and have and are taking back. There is Dontosai, the new year’s celebration in which decorations are burnt and prayers are made for fortune and wealth in the coming year. Winter also sees the coming of the Pageant of Starlights as the city goes ablaze in sapphire radiance. The oceanic freeze is met with fires and lights and roaring music. We too take refuge in a very warm place. Hashimoto­san entertains us with her boisterous attitude, loud voice and shiny knives which she uses to introduce us to Miyagi cuisine. Sendai abura­fu ­ broth­soaked, deep fried, fluffy wheat gluten, beef tongue stew and all manner of grilled fish and soups. She jokes that thankfully when the tsunami hit, she was washed near her fridge which remained intact. Masae’s team rebuilt her home and since then her house and her dinners have become a hub for meetings between people rebuilding the community. The living room fumes with impossible warmth and resounding joy, the air itself is flavoured with fish and meat and vegetables. “Normally you can’t go to a disaster zone and find people laughing so loudly!” Someone says. Together with INJM, Hashimoto­san wrote Hashimoto Gohan ­ Hashimoto’s Tohoku Recipes, now available worldwide through Amazon. In doing so, they took a step in letting the world know that Ishinomaki and the communities of Miyagi Prefecture and the Tohoku Region were still there and that there was more to them than the disaster, they still held on to their culture and food and character which is unique even in Japan. The people of the Tohoku region speak a special dialect of Japanese ­ Tohoku­ben and themselves are more open, vocal and welcoming than the Western image of the timid, reserved Japanese. They eat drink and are merry, warm and make light of what has befallen them, in courage and celebration of life. Miyagi is home to Matsushima ­ the ‘pine islands’, an image known around the world, but rarely accredited to this rich and unique corner of Japan. Island after island of green mounds erect out of the sea in a beautiful cascade of forests which defy logic and litter the horizon. The ocean is beautiful here, and is the source of bounty and heritage for people in Ishinomaki­shi. But even so, summer comes and people fear the sea. It’s not easy to return to it unless necessity demands, so people do not rush to the beaches in swathes to celebrate the sun’s return. But INJM do. On their days off, Masae and her team spend time at the sea, in the water, being themselves and enjoying the community’s heritage ­ the ocean, and slowly, the tight knit community joined them, just like Sea Jetter, defying the sea monsters and taking back what was theirs. And a few hundred metres above the sea is the highest point in Ishinomaki, we go there often, where a banner and memorial stand. The banner of Ishinomaki­shi, at a point where the tsunami did not reach, the heights the community can reach, no matter how far the disaster took them, they would go further. And so the Manga Museum opens. The town celebrates for days with public cake and concerts. Families rush to the flying saucer­ shaped building where superheroes wait to greet their children. They’re all there, from Kamen Rider to Cyborg 009. Manga is a vital part of understanding Japanese culture, it is a form of graphic literature which is used to discuss social issues and fuel the aspirations of society and its youth. What better medium for the country’s superheroes, fables in which hope triumphs over disaster. Manga is of particular importance to the Tohoku region where many of the country’s beloved heroes actually originate. The building is three stories of comics, art exhibits and a movie theatre, celebrating the work of artists and storytellers such as local Shotaro Ishinomori. By celebrating in this way, the community is telling new stories, stories which when passed on to their children will not be all of devastation and despair, but of creation and joy and aspiration. Humans are a storytelling species, the narratives we tell each other and most importantly ourselves determine our futures. It is my hope that in time the world will come to know this community, not for what befell them, but for what they have built and celebrated. I watch as a young man climbs onto the roof of a shelter to repair it. He says only fools fix roofs and laughs. Yussif Osman­-Mansour is a young professional, working as a support worker for young refugees in the UK and as Head of Communications for the social enterprise accelerator – Peace Lab, composing language to promote and support empathy and the progressive movement. He is a graduate of an MSc in Conflict Prevention and Sustainable Peace and this is the primary field of his expertise, the issue of peace, its pursuit and the nuanced realities surrounding it. His studies included first-hand research with a number of stakeholders in Kosovo. Yussif Osman­-Mansour was a part of the relief efforts following the 2011 triple disaster in Tohoku, Japan and has also worked as a community organiser and caseworker for the Red Cross International Family Tracing Service. He founded a creative, storytelling enterprise – Hei Stories.